UCI Health offers three-dimensional mammography, a groundbreaking screening and diagnostic exam that can detect breast cancer earlier — and with greater accuracy — than standard digital mammography. Finding and treating breast cancers early, before they have spread beyond the breast, greatly improves the chances of successful treatment and long-term survival. According to the National Cancer Institute, the five-year survival rate is 98 percent for women treated for localized breast cancers. UCI Health breast radiology specialists use 3-D mammography, also called breast tomosynthesis, for most breast cancer screenings performed at UC Irvine Medical Center in Orange, Pacific Breast Care Center in Costa Mesa and UCI Health — Yorba Linda Multispecialty. To schedule a 3-D screening mammogram, please call 714-456-5655, 949-515-3544 or 714-790-8600. Studies show that 3-D mammography increases early detection of all breast cancers by nearly 30 percent, and invasive breast cancers by 40 percent. It is particularly effective at detecting masses in the 50 percent of women whose dense breast tissue makes malignancies harder to find with standard imaging scans. The clarity of the 3-D images also helps radiologists identify harmless abnormalities with greater accuracy, resulting in 15 percent fewer false alarms, follow-up screenings and unnecessary biopsies. 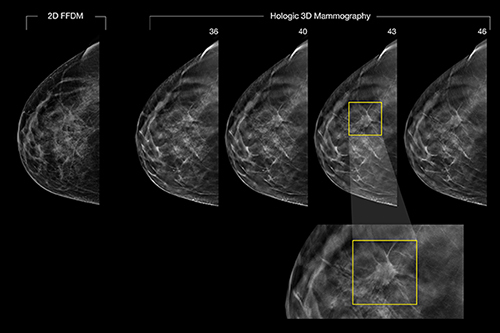 With newer 3-D technology, there is no significant increase in radiation over standard digital mammography. 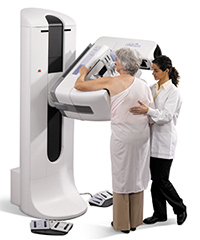 Three-dimensional mammography is similar to standard digital mammography. The patient stands at the machine, breast resting on a platform and compressed from above by a paddle to ensure that the images taken capture the whole breast. 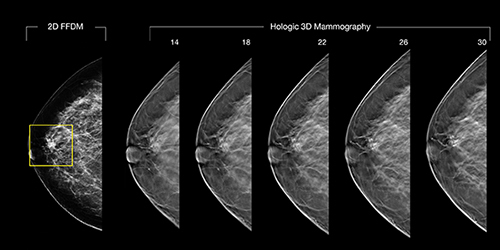 However, unlike standard digital mammography, the Hologic Selenia® Dimensions® 3-D system uses a low-energy X-ray tube to sweep in 15-degree arcs over the top and the side of each breast, gathering a series of images from multiple angles in seconds. A computer integrates these images, reconstructing them into one-millimeter slices to create unobscured views of different layers of breast tissue. This allows the radiologist to examine the breast tissue in each image in greater detail, rather viewing than flat images of the entire breast. In the example above, there is no evidence of suspicious lesions in the far left panel of these standard 2-D mammography images. In a 3-D screening of the same patient, however, a 15-millimeter mass is revealed in several "slices," and is most visible in the fourth highlighted panel. What appears to be a suspicious lesion in a standard 2-D mammography image in the left panel above is shown to be normal in a 3-D screening mammography of the same patient, making a follow-up diagnostic exam unnecessary. The 3-D mammography system is approved by the U.S. Food and Drug Administration for all women who would undergo a standard screening mammogram. The American Cancer Society recommends yearly mammograms for women beginning at age 40. Women at greater risk because of family history, genetic risk or other factors may need screening earlier.